MOVIE ?TREATMENT Terrence Howard? takes a break ?from quality ?cinema to play ?doctor in Joby ?Harold’s braindead ?debut.? This is a movie that should have a medical warning in its trailer. Caution: Viewing may be hazardous to your film-going fun; side effects can include drowsiness, irritation and difficulty swallowing. If a more preposterous major release made it to theaters in 2007, I managed to miss it. I wish I could say the same for the feature debut of writer-director Joby Harold. Before it even begins, Awake strains credibility with a couple of introductory paragraphs claiming that, of the 21 million patients who undergo surgery in the U.S. each year, as many as 30,000 do not actually go under when given anesthesia. Instead, the filmmaker would have us believe, these 30,000 Americans lie on the operating table paralyzed, feeling every excruciating slice and flick of the knife. This may be the holiday shopping season, but sorry, I’m not buying. Are you kidding me? If one farmer gets his arm caught in a thresher and has to saw it off with his own jackknife, the network morning shows are all over the guy like he brought peace to the Middle East. If people were getting surgery while conscious on a regular basis, they’d be on TV. If that many were, they’d be on TV every day. All day. Once it actually begins, the picture proceeds to strain credibility even further. Hayden Christensen plays a 22-year-old who inherited billions from his Manhattan real-estate mogul dad. He is in desperate need of a heart transplant but can’t seem to reach the top of the waiting list. That’s a good one. Maybe the fledgling director should have tried his hand at comedy. 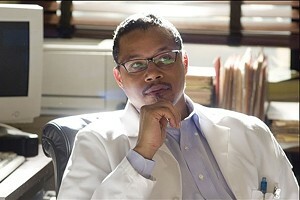 I’m guessing Terrence Howard lost a bet. The actor slums here as Christensen’s close friend, a cardiovascular surgeon facing four malpractice suits. In one scene he explains that, because insurance won’t cover the judgments against him, he’s as desperate for cash as his buddy is for a new ticker. When one suddenly becomes available, the super-rich scion insists that Howard handle the procedure. Which I found odd for a couple of reasons: First, Christensen’s mother (Lena Olin) has secured the services of the most eminent physician in the field. And second, how many hospitals are OK with uninsured doctors working in their operating rooms? No matter — the most farfetched and feeble-minded development is yet to come. Once he’s on the table and has received anesthesia, Christensen finds to his horror that he can feel everything the surgical team is doing. Now, you’d think this would almost certainly be the low point of his day. Nope. Because he can also hear everything his friend and coworkers are saying, and the topic of discussion is their scheme to kill him and steal his money. So all this laughable, highly unlikely stuff is happening. But the movie’s hook is the phenomenon of “anesthetic awareness,” and that’s an undeniably creepy premise — right up there with anything Poe wrote about being buried alive. The moment Howard plunges his knife into Christensen’s chest, and you hear the fully conscious patient cry out in voice-over pain, the film grabs you. For the better part of, oh, 10 minutes, Joby Harold has you right where he wants you. And then he does the most confounding thing. He changes the subject. Amazingly, Christensen’s anesthetic awareness is never mentioned again, even though he has still to undergo not one but two heart transplant procedures. Instead, the filmmaker has the patient’s spirit leave his body and roam the hospital, investigating the crime being perpetrated against him. That’s right. While his body is paralyzed on the operating table, his soul snoops around for clues and listens in on people’s conspiratorial conversations. It’s like an episode of “CSI” directed by M. Night Shyamalan. Well, Harold wishes, anyway. His directorial debut flatlines long before its final frame, but the prognosis for his career remains hopeful. Let’s face it: When you botch the job this badly your first time out, there’s nowhere to go but up.